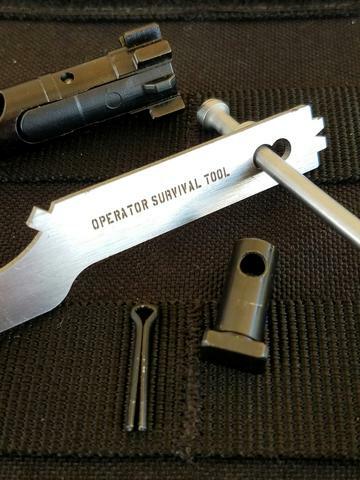 The Operator Survival Tool – Wrench is a supercharged castle nut wrench. In addition to tightening a castle-nut, it also scrapes carbon from the BCG, bolt, firing pin, and locking lugs. It has a screw driver bit slot, O2 canister wrench and mini pry tool. 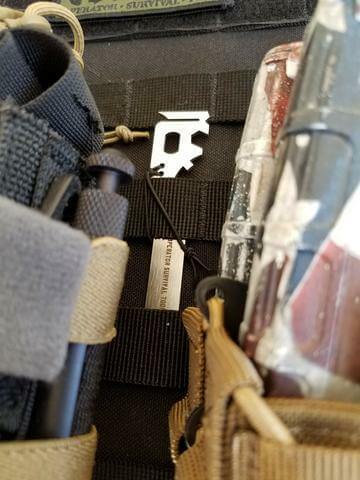 One of the most unique attributes about the Wrench is that it was designed to be secured to a single loop of MOLLE webbing. We use a durable shock-cord attached to the Wrench to keep it handy. Simply feed the Wrench handle into a single loop of MOLLE webbing, stretch the cord around the handle and let go. 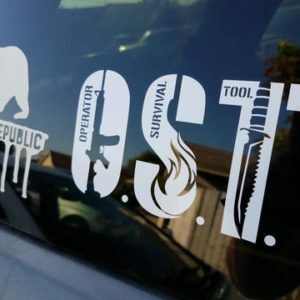 High quality 5.5in Die-Cut Vinyl Decals. Offered in both Black and White. Our BLACK shirts are Gildan DryBlend 50%Cotton 50% Polyester. They are screen printed with your “GRUNGE” LOGO on the front left chest and across the back. The O.S.T. Wrench 10 is made from precision ground D2 steel and laser cut for precision. 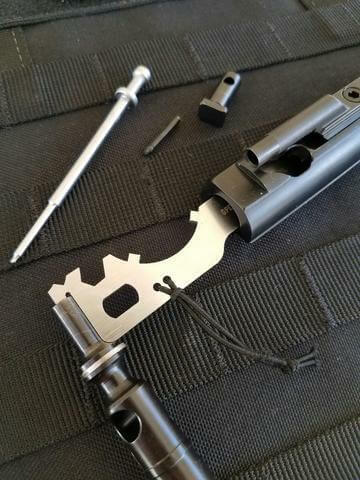 It scrapes clean carbon from the back of the 308 bolt neck, inside the 308 bolt carrier, around the locking lugs and around the firing pin. 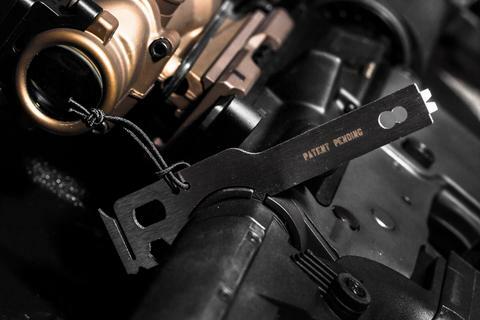 The Wrench 10 has the ability to tighten a loose castlenut in the field and is designed to be able to attach to a single loop of MOLLE with supplied shock cord for convenient storage. 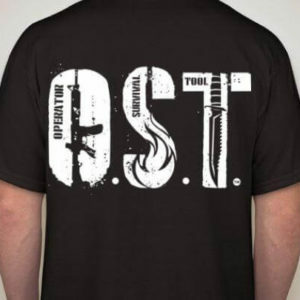 The O.S.T. 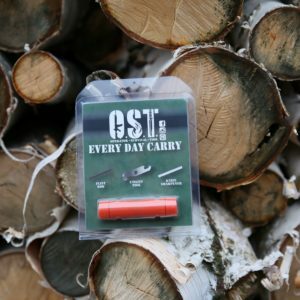 – EDC is a fire starting, knife sharpening, food gathering survival multi-tool. The hardened stainless steel utility tool has a can opener, bottle opener, gut-hook style blade, screwdriver bit slot, Phillips and flat-head screwdrivers. The Blaze orange housing can be used as a handle with either the medium grit ceramic rod to sharpen knives or with the flint rod to product sparks using the steel tool as a striker. 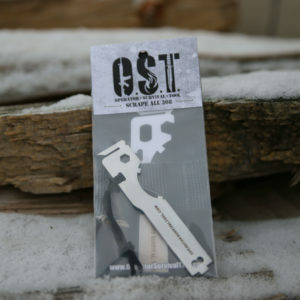 The supplied “Shim” has eight various sized break apart fishing hooks with eyelets sized for one inner strand of 550 cord.